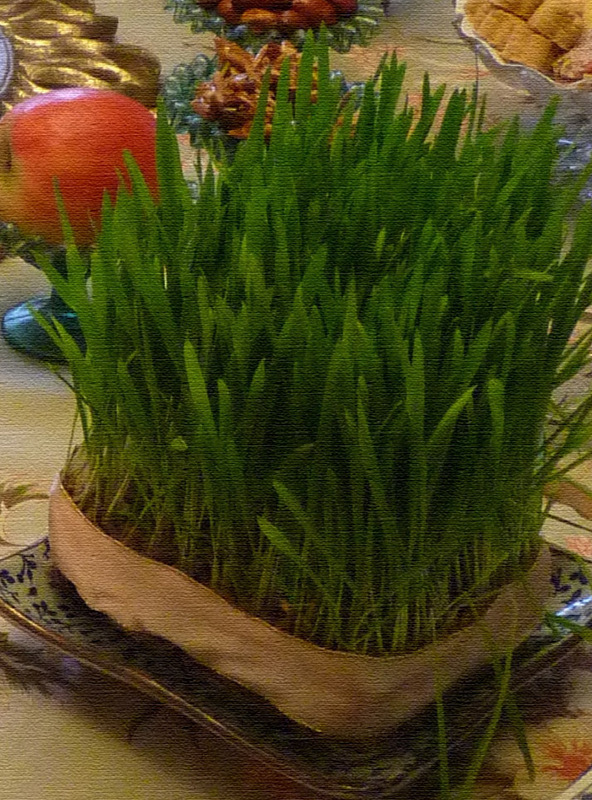 Norouz نوروز, the Persian New Year, takes place at 3:45pm today. The Persian New Year begins in tandem with the Spring Equinox, and the customs associated with Norouz also relate very closely with nature and the hopefulness that the beginning of Spring embodies. Many people outside of Iran, particularly residents of surrounding regions such as Afghanistan, also celebrate this holiday. The most significant symbol of Norouz, which has its origins in Zoroastarian traditions, is the haft-seen هفت‌سین table spread. The haft-seen traditionally includes seven (haft) edible items that start with “seen” (س ) an “S” sounding alphabet. Each household normally creates a decorative haft-seen and this is left up throughout the New Year season, which lasts for 13 days. Norouz involves a series of events, starting with Chaharshanbe suri چهارشنبه ‌سوری‎, which takes place on the Tuesday evening before the New Year. Chaharshanbe suri involves jumping over small fires in order to cleanse oneself of the outgoing year’s bad luck, while taking on the vibrancy and purity of the flames. The Chaharshanbe suri festival takes place each year in Ambelside Park in West Vancouver, and is enjoyed by individuals and families of all backgrounds. Norouz is a time to connect with friends and family, and this is illustrated by ayd deedanee, where younger members of a family or community visit seniors in the area to pay their New Year respects. This is often followed by baaz deed, when those who received visits pay return visits. It is common for community elders to stay at home on particular days during the first part of the New Year period, while others stay at home on particular times later on in the season in order to make themselves available for visitors. Younger visitors may also receive a small amount of money when they give their New Year greetings. The final day of the New Year is marked by sizdah be-dar, where communities converge on parks and riversides for picnics, like the celebration on March 30 at Whytecliff Park. The sabzeh (from the haft-seen), which has absorbed the negative energy from the home over the New Year period, is thrown into the river. The UBC Persian Club is hosting a Norouz Countdown & Celebration event at UBC Point Grey on Thursday morning. The club is also partnering with Asian Library to set up a haft-seen that can be viewed from Thursday evening for the full 13 days of Norouz (through April 1), with the exception of March 26, when the haft-seen will travel to the Fred Kaiser building for a Norouz Music Event. “What Is Norooz, The Persian New Year, All About?” Huffington Post Canada. “North Shore Persian Families Prepare for Norouz.” North Shore News. This entry was posted in Commentary, Events, Global Affairs by annawong. Bookmark the permalink. I am very happy to live in a place that celebrates and respects human plurality. Very informative and very joyous–thanks for sharing, Shirin! Happy Norouz to all!